Politics generally isn’t something I pay attention to. I generally stay away from topics that directly bring disharmony into my existence. Having said that, I recently saw a headline concerning “Trade Wars”. The economist in me started looking at that every now and then. Recognizing patterns of human existence interests me. I don’t pay attention to politics as such, but tariffs, exchange rates and protectionist behavior is something to be aware of. With political protectionist behavior comes protectionist behavior of the masses; this often shows up as aggression. In Yoga and Martial arts there is an understanding of the collective consciousness. Where groups of people who believe the same stories, think and behave in the same way. Sometimes this is beneficial, most often….not. If you have no awareness of what is influencing you, you have no awareness of your own behavior, unless someone with a different perspective shows up in your reality and makes you question things. The Last Samurai is one of my favourite movies. There are many aspects of this movie that I love. One is how Capt Algren (Tom Cruise) learns to speak Japanese in the same way that I did. From children. I lived in Japan for about 4 years. They taught me Japanese and Japanese culture and I taught them English. I learned to speak, read and write at possibly intermediate level, sufficient to support me in a corporate environment as well. While it was not easy being a Western woman in rural Japan, I learned so much. The Japanese people are refined. The culture is subtle, it is not as harsh as Western culture. I believe if we make an effort to understand people & relate to them, rather than control them, there is less likely to be conflict. Unfortunately it is however the nature of humanity to fight. 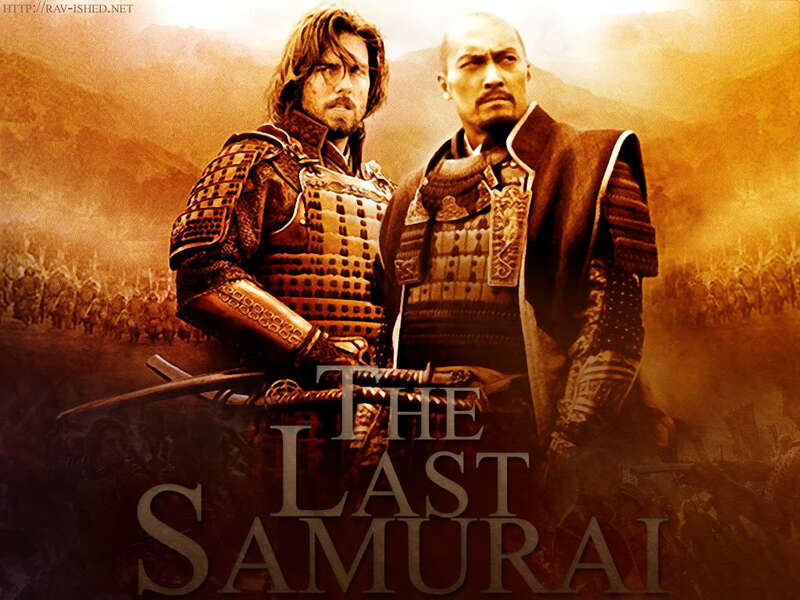 The Last Samurai is a story of tradition and principles on one side versus greed for power on the other. The Samurai were people (both men & women) who fought face to face with swords. Bringing guns into the equation in this movie left me with a sense of cowardly unfair betrayal of their own culture. With a realization that came too late. Of course this is a movie and truthfully speaking I have no idea how historically accurate it is. While I love this movie, mostly as nostalagia because if reminds me of the village and rural area in the alps where I lived, I do need a box of tissues to get through it every time I watch. This movie teaches reverence, honour, loyalty, courage and compassion. All of which are aspects of both Yoga and Martial Arts. Values and cultural depth which Western cultures are quickly losing in exchange for consumption of disposable items. Here are a few of my favourite lines. “Katsumoto: You believe a man can change his destiny? Algren: Every man does what he can until his destiny is revealed”. “Nations, like men it is sometimes said, have their own destiny”. Nathan Algren: You have no idea what I’ve done. Katsumoto: Yet you do not fear death, but sometimes you wish for it. Is this not so? It happens to men who have seen what we have seen. But then I come to this place of my ancestors, and I remember. Like these blossoms, we are all dying. To know life in every breath, every cup of tea, every life we take. The way of the warrior. I do not presume to understand the course of my life. I know I am grateful to partake in all of this. Martial arts is not about the fight and yoga is not about the postures. It is about perfecting a set of principles. 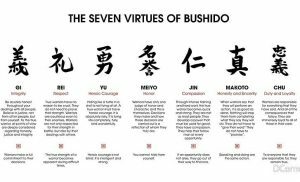 Rectitude, Courage, Benevolence, Politeness, Sincerity, Honor, Loyalty, and Self-control. In speaking about reverence for ancestors, a few years ago I did my own genetic testing and DNA for a family tree research project. It unearthed many recurring patterns between the intergenerational lives of people, clearly showing me how we learn from one another and continue cycles unless we become aware and choose to make necessary changes. A few months ago I played foosball for the first time. Something very normal in North America, was totally new for me. At the time, he didn’t actually realise the depth of what he had said; or maybe he did. Similar to The Mahabharata in Yoga, this movie is a reminder. Do not get so caught up in the pursuit of self-importance, or fight for something that has no value; causing your own principles to be lost. “We cannot forget who we are, or where we come from”. In order to grow, it is necessary to question your own behavior and the influence of cultural conditioning. If something is not working; Change It, sooner rather than later. Hopefully the people currently negotiating trade deals, remember that their jobs are actually supposed to be for the good of social harmony; but then history does repeat itself. At the core of The Last Samurai is a trade agreement between the US and Japan, in which the Samurai and cultural traditions end up dying.